Some people in Columbus might not know how important a load calculation is when installing a furnace in their Columbus home. There are a number of benefits to this process that we will explain below. We’ll also talk about what exactly a load calculation is. Load calculation is a measurement that is taken of your home to determine exactly how much heating and cooling your home requires. During the load calculation process, the contractor will measure the total volume of air that is in your house and determine how efficient your insulation is. Other factors that they will consider are: local climate, shape and orientation of your home, how many windows you have, the number of occupants and more. Inefficiency – When your furnace is too big, it heats up your home very quickly and then shuts off. When the temperature drops again, it has to turn on again and heat up the home. This is an inefficient way to run a furnace. Temperature swings – This causes wide swings in temperatures and hot and cold spots in your home. Humidity – When the furnace doesn’t run for a long period of time, the air can become stuffy or clammy. Wear and tear – All the stopping and starting causes extra wear and tear on your furnace. As you are probably quickly realizing, there are a number of benefits of having a load calculation taken of your home. Greater efficiency – When your furnace is the right size for your home, it doesn’t have to work too hard to heat your home. Greater comfort – You won’t see the drastic swings in temperature that a large furnace would cause in your home. Long life – When your furnace doesn’t constantly cycle on and off, it can potentially extend its life. 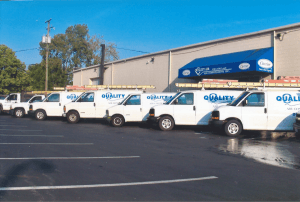 If you’re having any issues with your furnace, contact the experts at Quality Air Heating and Air Conditioning. We offer comprehensive furnace services in Columbus. Call us today!